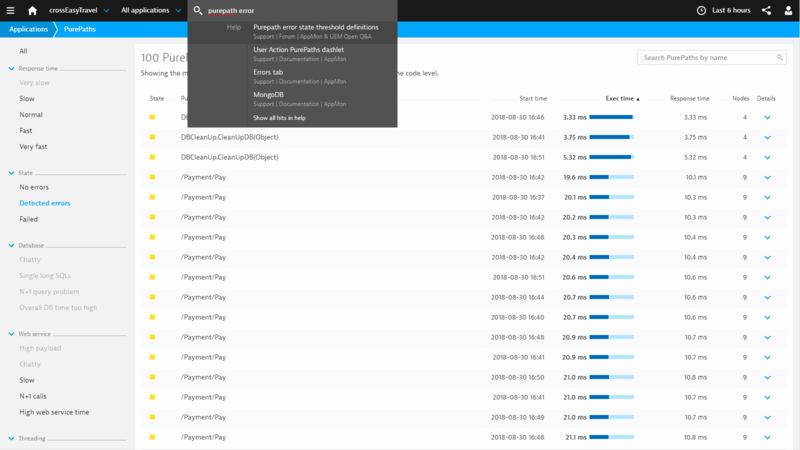 What&apos;s new in Dynatrace AppMon & UEM 2018 October? 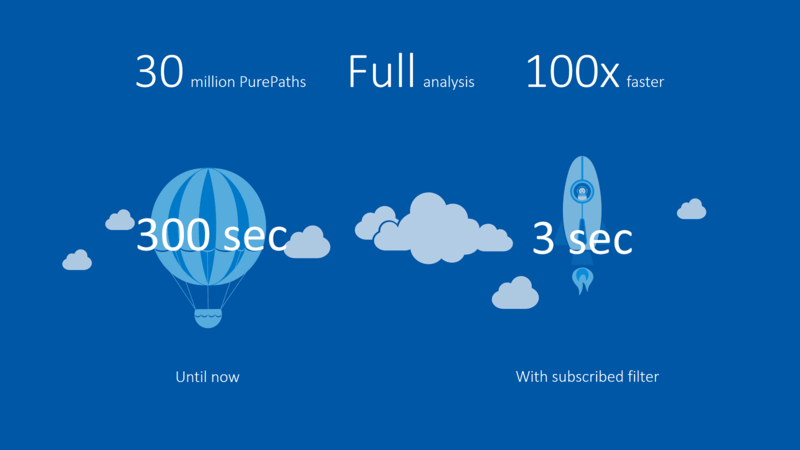 Two releases ago we started a journey with a single goal in mind: to scale with you as you move to the cloud. 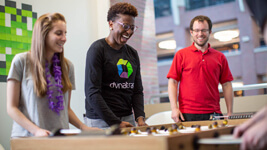 Along the way we connected the transactions between components covered by AppMon and Dynatrace to close gaps as you co-deploy. 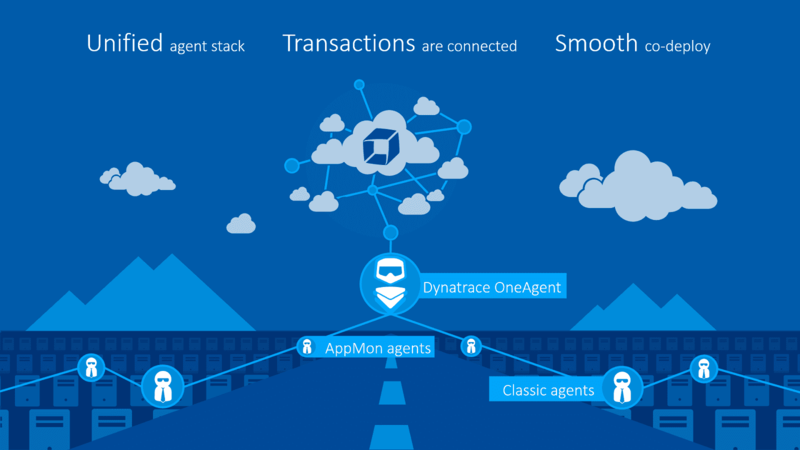 Now, we finished unifying the agent technology stack between AppMon and Dynatrace with full technology support for the AppMon agent, now including Java and .NET. Vastly improved loading performance up to 100x by subscribing dashlet filters. Available for important dashlets like business transactions, errors, web requests and more. Everybody benefits from subscribed filters as they are applied globally per AppMon Server. Central management of filter subscriptions in the server settings. This release gives administrators full control of which components to update and which to be left untouched, reducing the hassle dealing with slow-moving apps. No need to wait. Update your AppMon server and collectors to 2018 October and plan the update for each component as it fits your schedule. You have full control over which tiers need to be updated or left temporarily untouched due to older technologies or a limited deployment window. Automation first. Convenient maintenance is either possible via agent overview or REST. 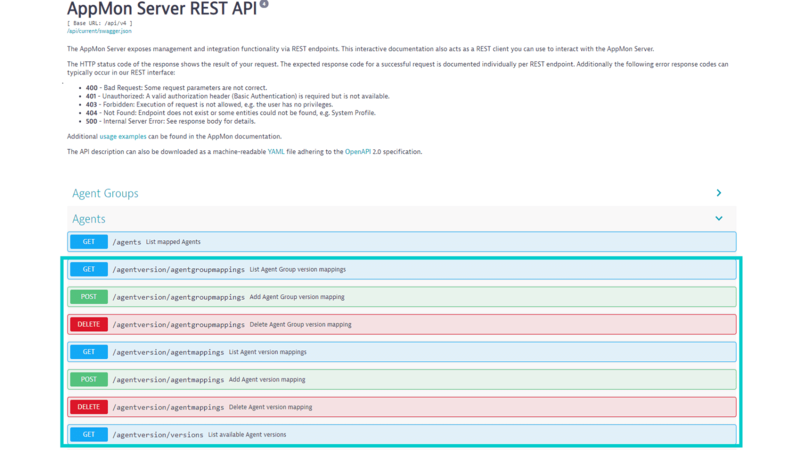 Dynatrace AppMon is already shipping the required Java runtime for convenience and supportability reasons. Due to major changes in licensing for the used runtime, AppMon now has the ability to update the Java Runtime Environment for all components. In other words, an admin can easily update to a free and redistributable Java runtime version with a simple click. It works like the regular AppMon updates with download notifications. 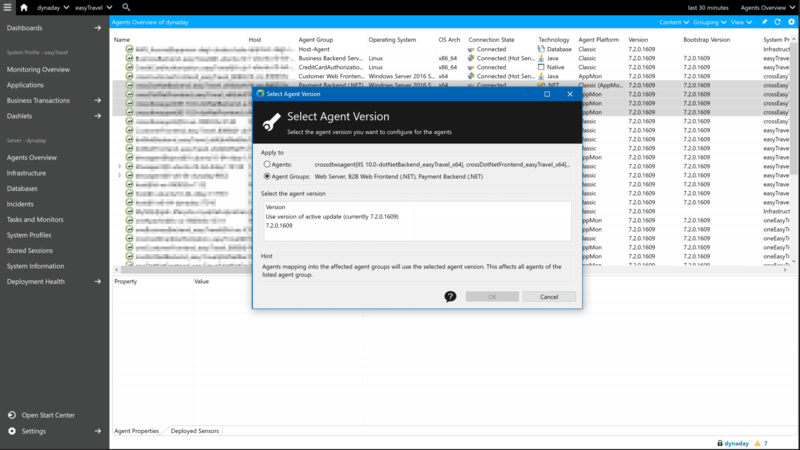 The new AppMon agent agent platform is now used per default for new System Profiles with the remaining possibility to easily switch agent platforms for existing System Profiles. Wrapping web requests into user actions no longer necessary—AppMon is able to display web requests outside of user actions. iOS Agent is updated to the latest version of KSCrash. The support for Apache HttpClient in the Android Agent library is discontinued, as Android no longer officially supports it since Android 6. 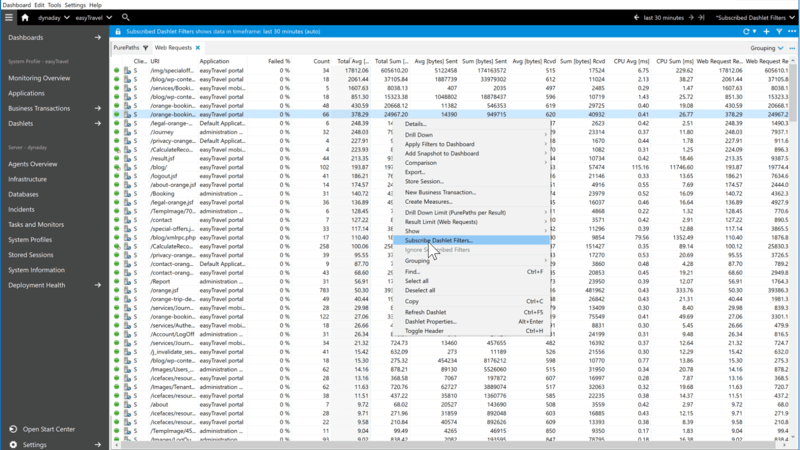 You can still monitor web requests made with this library by using the standard web request tracing method calls. Support for endVisit() calls inside a user action is discontinued, as it caused correlation issues. Instead, simply call endVisit() outside of any user action. The setMonitorCookie() call is removed and replaced with the more generic setBeaconHeaders() call. 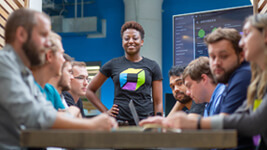 New to Dynatrace AppMon and UEM? 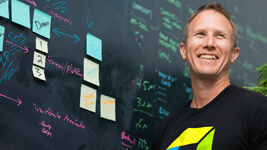 See the Getting Started Task Overview. Advanced user with specific use cases? 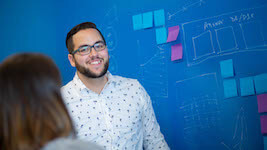 Quick links offer guidance for specific roles and use cases: developers, testers, business, operations, continuous delivery, and user experience. Free trial user looking for a basic install? See our Free Trial and Evaluation Guide. Setting up a complete installation in a live environment? See the new Installation Overview. Upgrading from a previous version? See our rebuilt Upgrade and Migration Guide. 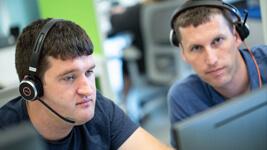 If you are missing required changes, contact support before scheduling the upgrade to clarify and resolve. The AppMon Server (backend process / Windows service / *NIX daemon) is only supported on operating systems that support Java 8. Only the included Java Runtime Edition is supported. Windows x64: 10/8.1/8/7 or Server 2008/2012/2016 with latest service pack; installer (.msi) does not need a pre-installed JRE; package contains a private Java Runtime Edition v8. Linux x64: With a recent kernel version 2.6 or higher. Installation requires a pre-installed Java Runtime Edition v8. See the Deployment Guide for detailed hardware recommendations specific to your load. 1 The maximum agent numbers consider a typical combination of different Agent types such as Java, .NET, host, WebServer, and PHP. In special circumstances, significantly more agents are supported. These are usually Host Agents. Contact support for guidance and confirmation. 2 No virtual cores (Hyper-Threading), for Medium and higher, a clock speed of 2.6 GHz or higher is required. 3 Required memory for the AppMon Server and operating system. If there are other processes running, then additional heap is required. To improve performance, AppMon always uses the maximum available CPU and memory resources. If you have more CPU cores or memory than required for the selected size, then AppMon uses them as well. No over-commitment of resources (CPU, memory, network, disk) and no virtual-only resources that are not backed by dedicated physical resources. Large and bigger VM is equivalent to a physical box in all performance metrics. For more details see Guidelines for running AppMon in VMWare. xLarge and bigger Database partitioning is mandatory. Compatible JVMs for Collector runtime: Oracle (Sun) JVM 1.8+ (included with Windows and Linux installers), IBM JVM 1.8+. 32-bit Collectors are not supported in AppMon 2018 October. AppMon also provides different Collector sizes. See the Deployment Guide for more information. See Set up Collectors and Collector best practices for a proper configuration of the Collector(s) environment. 1 Required memory for the Collector. If there are other processes running, then additional heap is required. 2 No virtual cores (Hyper-Threading). Windows x64: 10/8.1/8/7 or Server 2008/2012/2016 with latest service pack (certified). A private JRE 1.8 for runtime is included. The Linux Client package requires a JRE 1.6 or later for installation. A private JRE 1.8 for runtime is included. Mac: OS X 10.10/10.11 64-bit (supported). An Oracle JRE 1.8 update 121 or higher is required (no private JRE is included). The Java Webstart Client can be started with any Webstart compatible browser. Internet Explorer 8/9/10/11 and Firefox 38-48 are certified by AppMon. The Java Webstart Client requires a Oracle JRE 1.8 minimum update 45. Please note that as announcement by Oracle, Java WebStart is no longer included beginning with Java 11. Thus, the Webstart Client will no longer work. Alternatively, you can use the Portable Client if installing the Client is not feasible. AppMon Web is built for viewing on tablet devices and desktop machines that have a minimum browser resolution of 1024 x 768 pixels. For example, iPad mini physical resolution 2048 x 1536 versus browser resolution 1024 x 768. More details for your device can be found here. Drilldowns to the AppMon Client require a running AppMon Client. See the AppMon Client requirements for more details. AppMon supports partitioned tables for high-load scenarios for all supported databases. For all AppMon installations greater than Large, a partitioned database is mandatory. 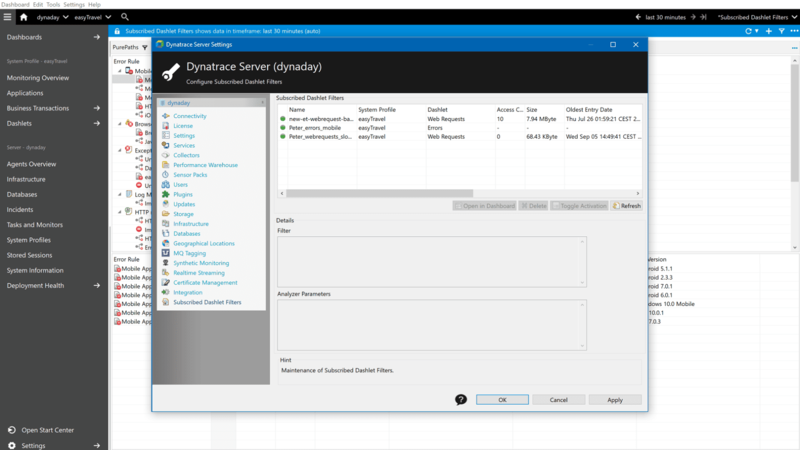 You can find more details in Performance Warehouse Partitioning for Dynatrace. To determine disk-space requirements for the AppMon repository upfront, factor 15GB per 1,000 persistent measures (of all system profiles within the AppMon repository). You can find more details in the Deployment Guide. 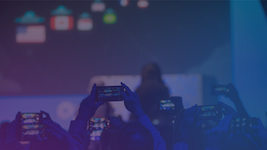 For third-party software, AppMon follows the End of Life (EOL) timelines announced by respective software vendors related to specific platform and version support. This means that AppMon announces EOL for support of specific platforms and versions once the respective software vendors announce EOL. 1 7 and 8 architectures. 2 No host agent or health information available. Note that we don&apos;t support AppMon Agent installation on distributed file systems such as NFS. 1 Only bytecode created by the Java Programming Language Compilers (javac) from supported JVM vendors. 2 Only SAP Java Server VM 6.1.038 1.6-b04 on Windows and SAP Java Server VM 6.1.018 / 6.1.034 19.1-b02 on Linux. 1 .NET Core 2.0 reaches EOL on October 1, 2018. It will be de-supported in updates, released after this date. 1 mod_php (for Apache Web Server) and PHP CGI (for IIS). 1 Only IBM JVM 7 on Windows, Linux & AIX. 2 Only IBM JVM 8 on Windows, Linux & AIX. 3 Only with AppMon Agent. 4 Only Fujitsu JVM 6/7 64-bit. 1 Not available on Classic Agent. 1 Java Thrift based Clients (Hector 1.0/1.1, Astyanax 1.x) and Datastax 1.0.2/2.1.0 - 2.1.3, 2.1.5-2.19, 3.0.0, 3.0.2. 2 MongoDB async driver is not supported. 1 64-bit support for AIX PPC, Windows x86, Linux x86, zLinux (Classic Agent only). 2 IIB 9 reaches EOL on September 30, 2018. It will be de-supported in updates, released after this date. 1 On Glassfish 4 and WildFly 8. Place JMS sensor on sender and receiver. No Agent needed on TIBCO EMS itself. 1 Java only, no Scala support. 2 v2.5 is not supported by AppMon Agent. 1 The NGINX Agent is only available for builds where the debug symbols are available. 2 Apache Web Server 2.2 only. 2 In certain cases the JS agent does not capture the correct end time for extjs 6 user actions if the promise API is used. 1 Only load actions, no special frameworks. 1 Supported for Android Auto Instrumentation. 2 Not compatible with TamperDetection. 1 EXCI and IPIC protocols (TCPIP and SNA protocols not supported). 2 WAS local mode configuration on CTG for Multiplatforms (not supported on z/OS). 3 Requires CTS 5.1 or later. 5 JCICS Program.link() and and StartRequest.issue() APIs. 1 CTG for z/OS: EXCI and IPIC CTG for Multiplatforms: IPIC (no support for TCPIP or SNA) CTG local mode: IPIC (no support for EXCI on z/OS). 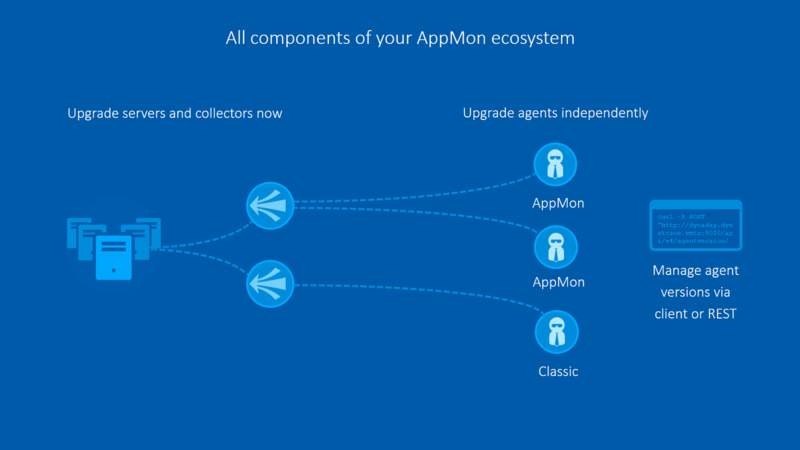 Dynatrace is fully supporting new AppMon versions for 18 months. 6 month extended support for critical production issues is available as part of the premium support offering. To better facilitate planning for updates and migrations the End of Life dates are now announced together with release dates.